This will turn banks into platforms that allow third party providers to offer a range of financial services directly to the bank’s customer. While there are a range of technologies that could let banks meet their obligations to offer a platform entry point to third party providers, the best approach would be for a bank to offer an API that third party providers can use to integrate securely and within authorised guidelines with the customer’s account. The PSD2 fine print spells out that each EU member state now has two years to create national legislation to regulate the new payments rights and responsibilities. Meanwhile, the European Banking Authority has a similar timeframe to progress through a series of consultations that will define a set of technical standards that guide payments operations. But banks should not be fooled into a false sense of complacency. As Paul Rohan, author of PSD2 in Plain English spells out, the creation of technical standards by the European Banking Authority should be considered the finish line for banks taking action towards an open banking platform, not the starting point. Already, some banks, fintech startups, and industry networks are working to build a new platform approach. There is not an inexhaustible supply of fintech partners who can work with each bank to build their own separate ecosystem. Savvy, market-wise fintech players are already recognizing the opportunities that PSD2 will offer and forging relationships with banks. whether that be a global view of all their finances, or instant payments for their purchases. Banks have an opportunity to be the platform where customers and third party providers connect and create value. 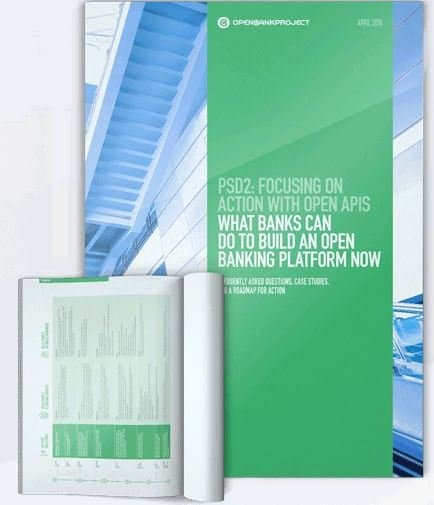 Open Bank Project API: From an idea to … the coming new banking reality! ← Fintech Startups: Right! I wish I absolutely knew that!